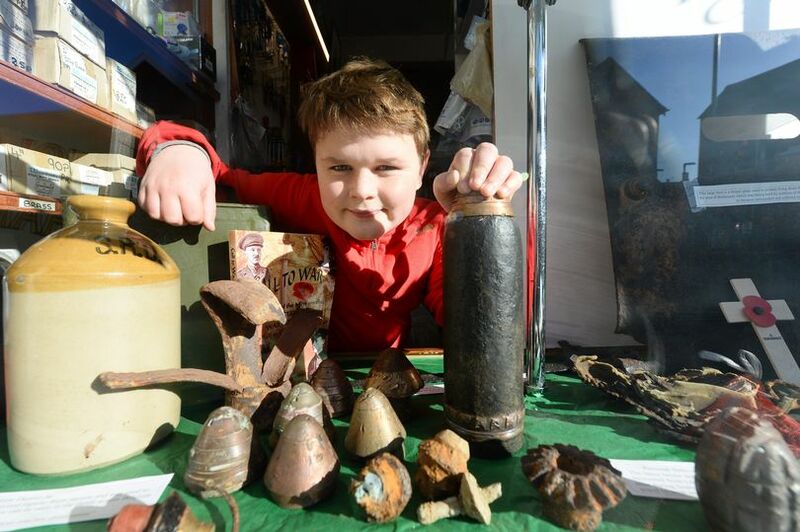 In the district of Wolstanton, Richard Byatt, 11 years old, transforms the shop window of his dad’s shop into a show of uxo, dated back to the first world war. Obviously, this material is very dangerous, we hope that the authority will do its job. S.J.A.L. Schoolboy Richard Byatt has produced a window display of World War One artifacts he unearthed in France and Belgium – to mark 100 years since the conflict ended. The talented 11-year-old has transformed the window at his parents’ hardware store in Wolstanton to leave residents and shoppers impressed. Richard has grown the collection over a year after first visiting the Somme in France with dad Bill. Nel Comune di Wolstanton, Richard Byatt, ragazzino 11-enne, trasforma la vetrina del negozio del padre, in una piccola mostra di residuati bellici, risalenti alla prima guerra mondiale. Naturalmente si tratta di oggetti pericolosi confidiamo nella saggezza della famiglia e nei controlli delle autorità. Gli ordigni a dire della fonte sono stati recuperati in Francia e Belgio.